My route into the history of alcohol in Mexico took me through pre-Columbian, colonial and nineteenth-century history, so for me, this area of research has always been synonymous with pulque, the alcoholic beverage that predominated throughout this long time period. But, whenever I introduce myself as a historian of alcohol in Mexico, the first word 99% of people say is “tequila”. Until now, tequila has actually taken up only a small amount of my attention (at least in scholarly terms! ), but in the Consuming Authenticities project where we are exploring how pulque’s status as “authentic” has changed over time, it has become increasingly important to examine that process alongside the history of tequila. Like pulque, tequila is made from a type of agave plant, although they are not produced from the same type of agave and while pulque is fermented, tequila is distilled. Unlike pulque, tequila has Denomination of Origin status—awarded in 1974, the first product to be so designated in Mexico. This legal protection means for a distilled agave liquor to be called “tequila” it has to be produced from the blue agave plant and it has to come from a specific region in Mexico, covering the state of Jalisco and parts of the states of Nayarit, Michoacan, Guanajuato and Tamaulipas. I have recently been reading a fascinating book by Marie Sarita Gaytán, ¡Tequila! 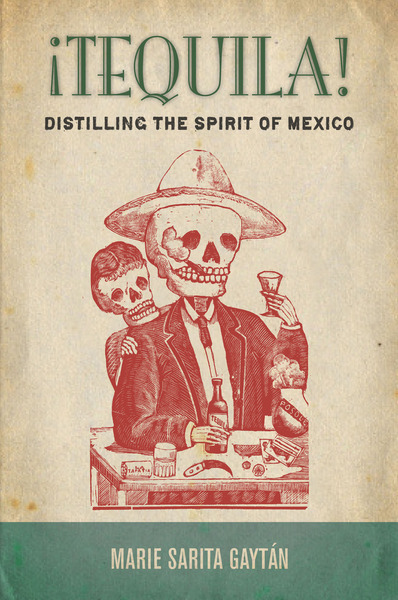 Distilling the Spirit of Mexico (Stanford University Press, 2014), that traces the history and cultural importance of tequila and explains how and why tequila was singled out for this protection. This story is very much intertwined with the history of pulque. As Gaytán’s book explains, by the turn of the 20th century, tequila started to symbolise ideals prioritised by Mexico’s leaders, such as progress and modernity, in ways that a drink like pulque never could. In the 19th century, some artists and intellectuals did celebrate pulque as authentically Mexican because of its ancient roots and its place in popular culture: this helped them to try to create a vision of Mexican nationhood that at once had historical longevity and cultural relevance. However, many of the same intellectuals, politicians and others besides, viewed pulque as a major ingredient in holding back Mexico’s progress as a nation, which they mainly saw as the consequence of the ordinary people’s “backwardness” or “unruly” nature. “Do you know to what we owe the ignorance, degradation, laziness, sickliness and social death of Mexico’s common folk? The use of pulque.” El Diario del Hogar, 28 March 1882. A typical expression of such sentiment from a popular Mexico City newspaper. Gaytán argues that tequila took on the symbolic attributes of Jalisco, a region of Mexico seen by members of the intellectual, political and economic elite as ethnically less indigenous and more Hispanic, as economically thriving and as technologically sophisticated by the beginning of the 20th century. Then, tequila became further associated with national events and icons in the next half century, especially through popular films and songs, such as the revolutionary hero Pancho Villa, an idealised and romanticised rural landscape, and the charro, or Mexican cowboy. This combination of nostalgia for an idealised past and a forward-looking image of technological innovation and economic success continues to be mobilised in the marketing of tequila as an authentically Mexican product. Gaytán includes some very interesting discussion of her ethnographic experiences at Mundo Cuervo, the Tequila Sauza distillery tour, the Tequila Express and a 5-month Tequila Studies diploma at the University of Guadalajara. Most interesting, from my perspective, is the use of a figure from pre-Columbian Mexican culture—Mayahuel, the Aztec agave goddess—to project an image of tequila as a timeless part of Mexican culture. This simultaneously echoes the previous artistic use of Xóchitl (see my earlier post) in constructing pulque’s authenticity as a deep-rooted part of Mexican culture and marks a significant departure from it. While Xóchitl’s story, at least some versions of it, create a historical link between Mexico’s ancient indigenous past and all its attendant politics with its contemporary present, Mayahuel conjures a more abstract, naturalised association of timelessness, that is, ahistorical. I have written a review of Gaytán’s book, which will be published in the Journal of Latin American Studies soon.